I'VE never really related to the Aussie stereotype and I suspect I’m not alone. That’s because it tends to exclude most of the population, the rather large portion made up of women, immigrants, indigenous citizens and non-heterosexuals. For the rest of us, Australia's blokey image is an ugly and ill-fitting one we’re forced to grin and bear, like the hideous top your aunt bought you in 1998 which you have to wear every Christmas. IT was the moment I considered cooking tofu for Australia Day that I began to wonder if I wasn’t as Australian as I perhaps should be. It shouldn’t have been a surprise, frankly. I’ve been displaying ‘‘un-Australian’’ tendencies for some time. I don’t like the beach, for one. I think footy’s dull and I find cricket a bore.My parents never owned a barbecue, or went camping. I didn’t even own a pair of thongs until I was 25. My saving grace is I enjoy beer and meat pies, often at the same time. This, we are told, is what it means to be Australian. Beer, pies, cricket, footy, barbies and thongs. Straya! The thing is, I’ve never really related to the Aussie stereotype and I suspect I’m not alone. That’s because it tends to exclude most of the population, the rather large portion made up of women, immigrants, indigenous citizens and non-heterosexuals. Ask anyone to describe a typical Aussie and they’ll likely describe a blond white bloke, definitely straight, probably with a few tatts, who loves a drink, loves sport even more – and who yells ‘‘Oi! Oi! Oi!’’ in public spaces. enjoy their hegemony. For the rest of us, however, Australia’s blokey image is an ugly and ill-fitting one we’re forced to grin and bear, like the hideous top your aunt bought you in 1998 which you have to wear every Christmas. We’re currently showing ourselves off to America in the annual ‘‘G’day USA’’ event, which concludes next week, where the focus has been on our ‘‘celebrity chefs’’ and winemakers. But generally speaking, an interest in arts and culture is not high on the list of stereotypical Aussie attributes. ‘‘Real’’ Australians don’t sing and dance, or go to the theatre. That’s poofy. ‘‘Real’’ Australians don’t sip wine and discuss its acidity and mouthfeel. They drink beer . . . by the slab. ‘‘Real’’ Australians don’t eat fancy schmancy gourmet food. They eat mountains of chops and huge steaks, in one go, and wash them down with another slab. This last point in particular is rammed home every year in the lead-up to Australia Day, so we don’t forget, by Meat and Livestock Australia. 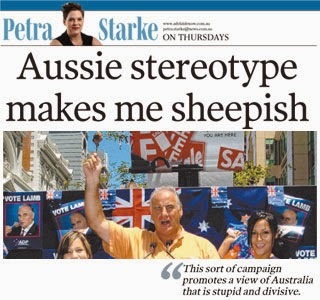 Or, rather, by Sam Kekovich, otherwise known as The Most Australian Person In The Land. If there’s a more blatant example of Australia’s dopey, blokey culture than the MLA’s annual lamb commercials, I’m yet to see it. poofy /not lamb or whatever else ‘‘un-Australian’’ means. The quiz doesn’t reveal the right or wrong answers, but it’s safe to assume it posits the following as representing ‘‘Australian-ness’’: a Chiko roll, a handlebar moustache, a bulging, white, male bicep sporting a southern cross tattoo, sickies, Bob Hawke skolling a beer, a cask wine bag hanging from a Hills Hoist and a pokie machine. I realise it’s tongue in cheek but this sort of campaign promotes a view of Australia that is stupid and divisive. I played the quiz four times and didn’t see a single female, apart from Dame Edna. The only nod to indigenous culture was a picture of two tourists climbing up Uluru, which I sincerely hope was supposed to be a representation of something ‘‘un-Australian’’. For the record, I was declared 70 per cent un-Australian and told to rectify the situation by watching nine hours of cricket per week, calling everyone ‘‘mate’’ – and buying some lamb. Anyone know any good tofu recipes? First published in The Advertiser, January 17, 2013.